Located in the Spey Valley amidst some of Scotland's most beautiful scenery, Woodville B&B at Ballindalloch near Glenlivet, offers 4-star quality bed and breakfast accommodation in a choice of three ensuite bedrooms with extremely comfortable beds. Woodville is surrounded by peaceful woodland and conveniently positioned a few hundred yards from the A95 between Aberlour and Grantown on Spey. this is Whisky country - Glenfiddich, Glenlivet, Glenfarclas, Macallan, Aberlour, to name but few! Or why not just relax and get away from it all - you really couldn't ask for a better place. Now celebrating 15 years at Woodville, your hosts, Maureen and Robin, have the experience and know how to give you an very enjoyable stay. 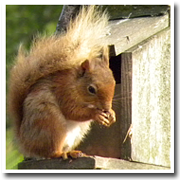 Red Squirrels are such regular visitors to our garden we can virtually guarantee you'll see them eating their breakfast whilst you're eating yours!